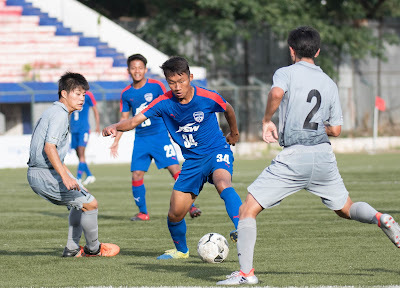 Striker Jinya Kishi scored twice as Bengaluru FC Reserves went down 2-1 to Avispa Fukuoka U18s in a friendly held at the Bangalore Football Stadium, in Bengaluru, on Saturday. Vice-captain Prashanth Kalinga’s 86th minute effort was a consolation in a clash that saw Blue Colts’ custodian Jafar Mondal named Man-of-the-match for an inspired show in goal. The Blues started cautiously, keeping possession in midfield as Head Coach John Kenneth Raj started with Robinson Singh in midfield alongside Biswa as captain Leon Augustine and Nonganba Singh manned the flanks. Shots from Leon and Isak Vanlalrutfela went inches wide of the target before Jafar stepped up to pull saves off strikes from Minato Kai and Kojito Omori in the first. Despite some fine build up play, both sides lacked the finishing touch required as half-time arrived with the scores unchanged. Kenneth sent on Alwyn George on in the second half as he joined Robinson in midfield for the Blue Colts, adding more solidarity to the attack. However, it was the Japanese side that took the lead early in the second half. After a stubborn run and cross from Yuji Kitajima, Kishi found himself in space to slot home from close. A tense final ten minutes saw BFC fight back as Lalrintluanga’s effort was saved by Ryuya before Avispa extended their lead in the 82nd. Poking past the slide of Tonmay Saha, Kishi advanced into the Blues’ area and sent his shot into the far corner to make it 2-0. There was to be more drama as Jafar brought down Kitajima in the area with seven minutes to play. The midfielder stepped up to take the spot-kick but Jafar was equal to it, as the scores remained level. Refusing to back down, a short corner collected by Kalinga was curled in off the upright, as BFC cut the deficit with five minutes left to play. But it wasn't to be the comeback that the young Blues wanted as Avispa claimed the narrow victory. “I saw a good effort from our boys today. They’ve only had a few sessions together and I’m happy with the performance they put out. Avispa were technically very good and I’m sure the boys have learned a lot from this experience,” said Kenneth following the clash.